Happy Valentines DAy dear! I love this day! And your pink post is fantastic. I want all!! The plastic jacket is amazing and the sunglasses too. Pink kiss and love! Fantastic indeed. Love, love pink. No it is not my home. I just wanted to show that inspiration is everywhere. Much love always, my sweet friend. All die Dinge kann ich mir super gut an Dir vorstellen! Amazing! Love all the pink things, so cute! What a beautiful post ! I'm in love with the jacket and the skirt !!! 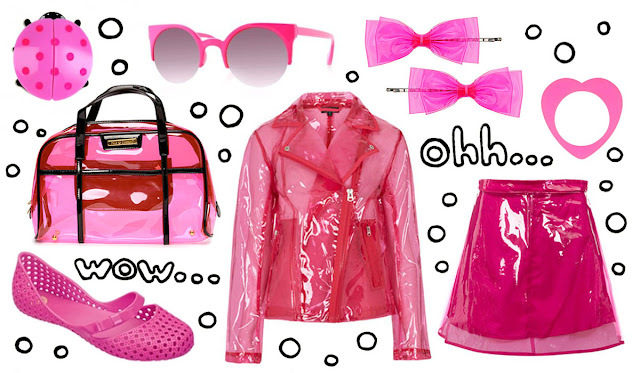 Where can i get the pink plastic jacket and pink plastic skirt?